Our Integrated Plumbing System (IPS) is THE OLIVETI COMPLETE PLUMBING NETWORK. 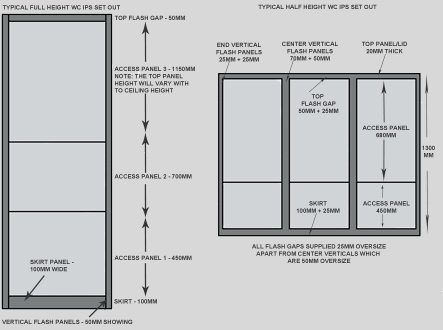 This is a system of duct panelling with either galvanised metal stud or moisture resistant timber framing, constructed as ladder frame assembly to eliminate the need for on site studding. The Complete Plumbing Network (CPN) is produced in our manufacturing unit under controlled conditions which ensures quick and simple site installation. All panelling is attached using concealed fixings to complete the 'look' and facilitate easy access to hidden services/plumbing. 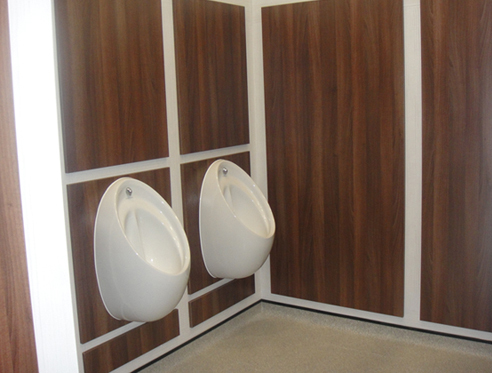 To accompany the Oliveti Complete Plumbing Network (CPN) we have several ranges of Sanitary Ware, Cubicles, Vanity Units, Lockers and Bench seating particularly suited to changing room situations. (Please click on 'PRODUCTS' and go to the relevant section). 20mm HPL faced particle board with either postformed verticle edges or all edges lipped with 2mm ABS high impact edging. White balancer to rear of panel. Compact Grade laminate for wet or heavy use areas. 18mm moisture resistant melamine faced board (MFC) for dry areas only with lipped edges. Lift on - Lift off concealed Keku-Clip fixings or push fit or hinged top panels for access. To either contrast or match the access panels. 20mm HPL faced particle board. 18mm V313 core moisture resistant melamine faced board (MFC) for dry areas only. 2x2 PSE WROT timber sections.